2018 has seen the publication, on schedule, of the second volume in the series of Edinburgh Companions to Global Christianity from Edinburgh University Press. Co-edited by Mariz Tadros, Todd M. Johnson and me, Christianity in North Africa and West Asia offers an account of the Christian presence in every country within these two UN regions. Building on the success of EUP’s best-selling Atlas of Global Christianity, this series takes the analysis of worldwide Christianity to a deeper level of detail. It offers both reliable demographic information and original interpretative essays by indigenous scholars and practitioners. It maps patterns of growth and decline, assesses major traditions and movements, analyzes key themes and examines current trends. 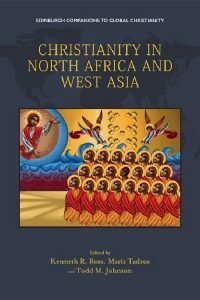 Besides country-level analysis, the volume on North Africa and West Asia examines each of the major Christian traditions. Given that the Orthodox tradition is the largest in this region, a distinctive feature of this volume is that it includes separate essays on “Eastern” and “Oriental” Orthodox traditions. There is also thematic analysis with essays considering the eight standard themes that run through the series: faith and culture, worship and spirituality, theology, social and political engagement, mission and evangelism, religious freedom, gender and inter-faith relations. Additionally, four essays address themes that are salient in this particular region: monastic movements and spirituality, ecclesiology, Christian media and displaced populations. A distinctive feature of the book is its very strong demographic basis, with the religious demography of each country and the region as a whole set out using an imaginative combination of maps, tables and graphics. The statistical and demographic information is drawn from the authoritative World Christian Database and World Religion Database, maintained by the Center for the Study of Global Christianity at Gordon-Conwell Theological Seminary and published by Brill. Another striking characteristic of the book is that it aims wherever possible for the essays to be written by authors indigenous to the country or region about which they write. Much of the literature on Christianity in the ‘Global South’ has, until now, been written by Western scholars. Without undervaluing such scholarship, the editors of this volume take the view that there is need for external analysis to be balanced by an account that is offered from within the context under consideration. The attempt has therefore been made, so far as possible, to recruit indigenous scholars who can write from a “critical insider” perspective. At the same time, a degree of flexibility allows for contributions from some exceptional Western scholars who have been highly identified with the region and are best placed to address particular topics. Working on this basis, we assembled an outstanding team of authors. They have very little material incentive. Their only tangible reward is a copy of the book itself. Their motivation has to come from their commitment to the region and to giving an account of the Christian presence within it. In a few cases circumstances militated against completion of the intended essay and replacement authors had to be found. But most authors were able to complete their essay as planned. The original insight and innovative analysis offered in the essays, combined with the reliable demographic information, give the book its authority. Both the statistics and the narrative make it plain that, proportionately, Christianity is in decline in this region, sometimes catastrophically so. In countries like Syria and Iraq, heartlands of the Christian faith since its beginnings, a sobering tale is told of Christian communities being uprooted and dispersed by the turbulent situation of the early 21st century. This makes for painful reading. At the same time, it is not all a story of decline, doom and gloom. The flipside of the outward migration of Christians is that several of the ancient churches have developed a far-flung diaspora and sustain their ecclesial life in such new contexts as Europe, America and Australia. There are also growth areas for Christianity within the region. Christian migrant workers have brought a strong Christian presence to the Gulf region while in several contexts there is evidence of growth in the numbers of “secret” believers who practise Christian faith quietly so as not to cause offence in their social context. Whether with ancient or modern expressions of Christian faith, the great question in this region is how Christianity can sustain and express itself in a predominantly Islamic context. However, the volume also considers nations like Armenia, Georgia and Cyprus where Christians form a majority and ancient traditions are being renewed. As with any edited book an element of relentlessness is required for its completion. Moreover, further pressure is brought to bear on the editors by our commitment to provide a complete and comprehensive account. Most anthologies can still fulfil their aims if one or two of the envisaged essays fail to materialise. In the case of the Companions every country, tradition and theme has to be covered so no allowance could be made for slippage. With 30 to 40 authors meeting the varying circumstances of life, especially in such troubled territory as North Africa and West Asia, it is to be expected that some will be thwarted and skill and sensitivity are required to find the best way to achieve the required result. The Press aims to publish a new volume in the Edinburgh Companions series each year. Preparation of the volume on South and Central Asia is well advanced with a view to publication in 2019. Meanwhile East and Southeast Asia is at the half-way stage and work is currently starting on Christianity in Oceania. Kenneth R. Ross, O.B.E., is an honorary fellow of the School of Divinity, University of Edinburgh. He is also parish minister at Netherlorn in Argyll and chair of the Scotland Malawi Partnership. Formerly professor of theology at the University of Malawi, he also served as general secretary of the Church of Scotland’s Board of World Mission. He is an editor of the Atlas of Global Christianity and the Edinburgh Companions to Global Christianity series. This entry was tagged Diaspora, Middle East, North Africa, West Asia, World Christianity by CSWC. Bookmark the permalink.